Bobby Byars was born the middle son of Carlton and Louise Byars in the mill village in East Griffin. Both parents worked in the local cotton mills. The country was in a depression; wages were low and money was scarce but they got by until things got better when Carlton bought a service station and Louise opened a six stool lunch counter next door. Bobby attended East Griffin Grammar School and attended grades seven through nine at Griffin High. Although a mischievous boy and an indifferent student, he rarely got into trouble either at home or at school. He had a quick temper but never let it get the best of him. As it turned out Bobby was born to be in the military and he knew it early on. At age fifteen he and four friends hitchhiked to Macon, lied about their age and tried to enlist only to be nabbed at the last minute by his father and unceremoniously returned to Griffin. But he left no doubts about it, he told his parents that as soon as he was sixteen he was quitting school and joining up. While biding his time till he could enlist, Bobby excelled at playing clarinet in the school band and worked at his father’s service station. He also used that time as any teenage boy would. Though slight of build he was a handsome young man and a snappy dresser. His blue jeans were always creased, his t-shirts was always clean, and as was the fashion of the day, his hair always slicked down with Bryl Cream. Bobby was very outgoing and had many close friends among his group of boys but it was his reputation with the girls that set him apart. He always had at least one girl friend and once, unknown to his family, had a brief engagement. Nevertheless, apparently his only true love was his Harley Davidson motorcycle which he doted on but nevertheless drove with such abandon that few of his friends and none of his family would ride with him. Bobby had only one known vice. As a preteen he slipped cigars from his Father’s service station inventory and from then on, except when he was in school or with his parents, he was rarely seen unless smoking one. True to his word, Bobby dropped out of school after completing the ninth grade, joined the U.S. Army reserves and ultimately joined the Army. Pfc. 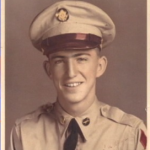 Bobby Byars was assigned to 3rd Battalion, 31st Regimental Combat Team, 7th Infantry Division and was deployed in late November 1950 east of the Chosin Reservoir near Sinhung-ri, North Korea. Within approximately three weeks of arriving, on December 2nd his unit was overrun by an overwhelming Chinese Nationalist force and had to withdraw in disorder leaving behind many dead American soldiers. Nothing more is known of the time, place or circumstances of his death. He was declared missing in action on December 12th. In the 1990’s North Korea repatriated 208 boxes allegedly containing the badly jumbled remains of U.S. servicemen. Years later, using dental records and DNA testing some of these remains were individually examined by the U.S. government and ultimately identified in November 2012 as Pfc. Bobby Ladon Byars. Bobby’s remains were flown to Atlanta and transported with great solemnity to Griffin by an honor guard of family, friends, veterans, and active duty servicemen and buried February 14, 2013 with full military honors in the Veterans Section of Oak Hill Cemetery, Griffin. Though not alive as she believed he would be, sixty three years after going missing his Mother’s prayer that one day he would return home was answered.